Universal cable tester with 256 test pins. 256 Point Universal Cable/Harness Tester. 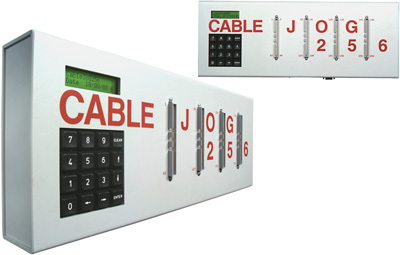 CableJoG 256 provides a flexible testing system to suit individual customer requirements. The CableJoG 256 can test up to 256 individual connections of all manufacturers of connectors. This simple to use test instrument stores up to 12 separate cable configurations. Each cable that is tested is compared against the stored details to produce a pass, fail, open/short/crossed indication. Call up one of twelve previously stored cable connection details. Transfer details in compare memory to one of twelve locations in the database memory. Connector pins 4 64 way via standard IDC header.